The Good Cheer quilt block would be considered a block at the intermediate level simply because of the number of pieces required for its creation. However, do not shy away from this block if you are a beginner quilter. There is nothing difficult to make -- you just need more time, patience and certainly accuracy. The Good Cheer quilt block is comprised of flying geese, squares and rectangles -- all easy units to make. 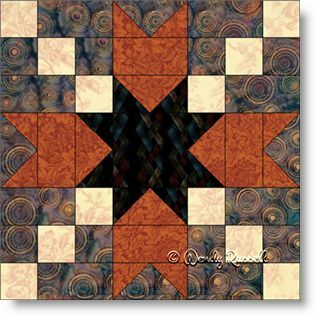 These sample quilt layouts are wonderful examples of just how different a quilt made of a single, repeated block can be, depending on how the blocks are set.